Home > Blog > General > Why choose SEM…? 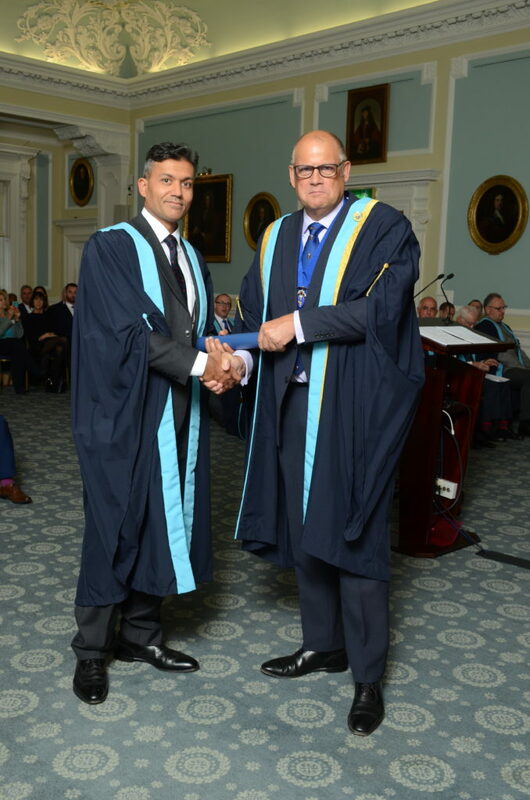 We asked one of our newer members, Mr Gaurav Batra who received his diploma at our most recent ceremony in September, to tell us why he decided to go down the SEM route and what he feels it adds to his professional career as an Orthopaedic surgeon. From a young age, I have always been interested in sporting performance. Later (at Medical School in Cardiff) curricular physiology experiments, specifically those related to cardiorespiratory topics, spurred my interest further. At the same time I was doing a considerable amount of sport, including badminton, running, cycling, swimming and weight lifting. To optimize my performance, I would often read about training methods that could enhance performance, taking advantage of the body’s natural ways of adapting to effort. I read about ‘carbo loading’ and the biochemical mechanisms by which this could be done. Fascinated to see how glycogen storage enzymes could be manipulated by depleting carbohydrate stores first, followed by carbohydrate loading, I tried this whilst at university and was successful in taking almost forty seconds off a 2400 metre time trial I had set for myself. Once in Orthopaedic training, I started treating a significant number of patients with musculoskeletal injuries. Over the years, I have also noted that a number of conditions can be prevented or helped significantly by simple interventions such as regular exercise, not (or stopping) smoking, drinking in moderation and importantly, eating healthily and weight control. Though operative intervention is always available, I felt that I was ‘missing a trick’ when treating my patients. I had started encountering more and more people each year whose body mass index is significantly above normal. Though I appreciated that osteoarthritis is not solely related to obesity and there are strong familial influences, I felt we could prevent or avoid significant osteoarthritis through weight reduction and exercise in a proportion of patients. To improve my patients’ treatment, I wanted to be better informed about topics such as nutrition, exercise prescription and how to motivate them to better ‘self-health’. This led to my very understandable decision that to do the FSEM Membership Examination. Meeting others doing the exam made me realise that I was working alongside likeminded doctors. Reading for the exam was an enlightening experience. A significant amount of progress has been made in basic science related to metabolism and physiology since I left medical school. Apart from refreshing my knowledge, I learnt a lot more about the new biochemical and physiological mechanisms. As an Orthopaedic Surgeon, practicing solely Orthopaedics, there would have been little opportunity for me to learn about the ‘leptin-ghrelin’ axis for instance. The syllabus also covers Sports Psychology in considerable detail. I have used this knowledge to help my communication with patients when setting targets and goals in clinic. Having the MFSEM after my name makes me feel I am giving my patients better care. Since I passed the exam, a number of patients have said they chose me as their surgeon because of the extra qualification. The FSEM syllabus is very extensive and, in my opinion, of great value to non-FSEM doctors. Specifically, I think that GPs, A&E doctors and Orthopaedic Surgeons would benefit from taking the exam if they are dealing with sports people. However, a lot of information can be used to help patients in general. Since passing the exam I have joined the Faculty and hope to go on and become an examiner in the future. I am keen to practice SEM as well as Orthopaedic Surgery and the two disciplines will help me tailor treatment for my patients for many years to come. I look forward to working with doctors who practice in the SEM way, putting prevention first. The NHS faces considerable challenges due to funding issues and I am sure the SEM will be of great benefit in reducing the burden.